Are you thinking about selling your home in Santa Fe? Your home could be worth more than you think! It is important not to rely on automated home value reports like Zillow Zestimates. Studies have shown them to be inaccurate up to 25% in some cases! Request a free consultation from our team for an accurate report. We take into account all the little details that could mean a much more favorable estimate and ultimately more money in your pocket on a sale. Give Brian Tercero a call today for a free, no obligation consultation. Or fill out the form below and he will begin working on a home value report immediately. Brian can be reached at (505) 930-9586. The Very Best Santa Fe Team is owned and operated by Brian Tercero and Dale Heinemann at Keller Williams Realty Santa Fe. Together they work as listing specialists on the team, assisting people with one of the most important transactions in their lives. 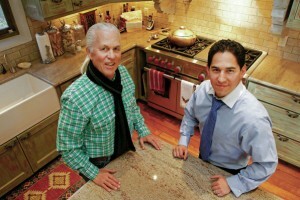 They have a deep understanding and expertise of the real estate business and a love and appreciation for Santa Fe. Combined with their experience in technology, marketing and sales, the two make a dynamic team which has resulted in hundreds of successful transactions in a short period of time. Breaking sales records each year, the team has been able to help people sell their homes for more money and much faster than the average in Santa Fe. They have been recognized for their innovative approach to marketing and selling real estate utilizing the latest in technology. The Very Best of Santa Fe Team was founded in 2012, since then they have quickly become one of the most successful real estate teams in Santa Fe. To receive your FREE home value report, fill out the form below or call Brian to arrange an appointment. Please include your home address in the comments below so we can begin our research on your homes value.